This scenic trail takes you on a tough 3150ft steady elevation gain hike looking out over the panoramic Verde Valley, Sedona and even San Francisco Peaks. Trail Description NOTE: We recommend you wear high boots and protective pants on this trail as the shrubbery is dense and often very spiky (my shorts and legs were torn up after this hike). The hike starts in a "no thrills" environment with grasses and low spiky shrubs, dropping into a wash before starting a very steady and long climb up the side of Black Canyon. As you start climbing, the panoramic views are quite immediate so look back once in a while! Gaining elevation, you will notice the vegetation change from grasslands, to shrubs, to Junipers, to Manzanitas and Cottonwoods, and finally Pine. Ascending through a few switch backs, around 1.5 miles you enter the Black Canyon with elevation around 4100 ft. You will parallel the creek/wash that can be heard running during the wet season. Around 3 miles of steady elevation, the trail will wrap around a crest and lose sight of Sedona. The surrounding wilderness is serene and you will be lucky to pass another hiker. Crossing an active wash around 4.6 miles, the trail wraps around the opposing canyon side revealing more expansive views around 5500 ft. After another 1.5 miles or so, you will crest the highest pass of the trail at 6133 ft. The views are never-ending, and the whole pass and mountain sides are covered with rich Manzanita...quite unique! Unfortunately, just beyond this pass, is a final but steep descent into the Gaddes Canyon. Based on the vegetation you have seen up to this point, you will be surprised by the Payson like flora of large pine and Cottonwood trees. Hiking along the flowing creek, find a comfortable resting spot and enjoying the peace and quiet. The return route is along the same route and aside from the initial steep ascent out of Gaddes Canyon, the trail is all downhill and facing the Verde Valley and Sedona. Hopefully you are returning late afternoon and will get to enjoy the sunset on Sedona. NOTE: although the official trail goes to the FR413 (an extra 3/4 mile), we found it nicer to make the riparian area in Gaddes Canyon, with flowing water and pines/cottonwoods, a better ending point (around 6.6 miles). Accomodations: (on site) Directions: From Phoenix, take the I-17 north for about 87 miles to Camp Verde. Take the exit 287 marked 260 West towards Cottonwood. 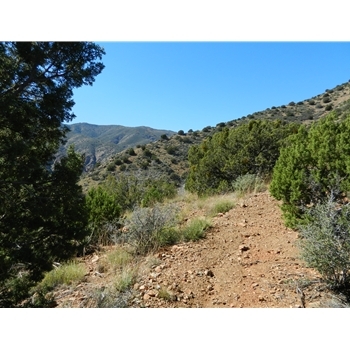 In about 9.7 miles, make a left onto Ogden Ranch Road and take this 3.2 miles to the trailhead parking lot. The trailhead is on the west side of the lot. Accessibility: Good dirt road, off-road vehicle not needed.